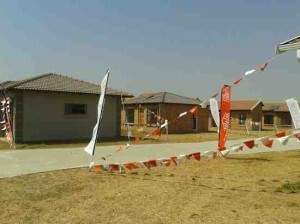 The recently held opening of the show village at Sharon Park Lifestyle estate, the Hlala Kamnandi Developments project between Springs and Nigel on the East Rand, was a huge success, says Gavin Vickers managing director of Kairos, the company mandated to market the homes at Sharon Park. The show village comprises 14 complete homes of different sizes, and the developer will begin construction on homes in phases two through five of the development for buyers who have obtained mortgage bonds within the next month, said Vickers. Renico Construction is the company who will be building all the homes here and who have been involved in repairing the homes from the previous development that were poorly constructed. They are still on track to complete 350 homes by the end of this year, and Vickers has said that he very happy that they are able to deliver to the community not just the affordable housing village they were promised, but a secure, lifestyle estate. The prices of homes at Sharon Park Lifestyle Estate range from R315 000 for two bedroom 44m² homes to R445 000 for the largest, which is 81,03m² with three bedrooms and two bathrooms, as well as a garage. The homes here will have all the finishes one would find in a standard new home, fitted countertops and cupboards and bathroom and kitchen fixtures, says Vickers, which differs from many other affordable developments where the buyer usually gets a basic “shell” which he pays extra to kit out with the finishes of his choice. 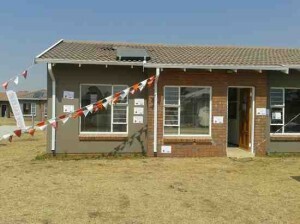 The living areas will be tiled, bedrooms carpeted and the garden’s lawn and home security is included in the price.